Background: Briefly flirted with hi-fi back in the 80's while in college. At the time, I had some hand me down speakers and a NAD 3020 amp. Favorite pastime was to go to the campus used record store and see what was new that week. Music then dropped way down on the priority list as family things took over while raising the ankle biters. Plus, it doesn't matter how good your system sounds if it only gets to play Barney, Teletubbies, or the Wiggles shows. Last couple years, the hifi bug started rearing it's head again. Set up what I had: same old NAD amp and some Bose cubes playing ripped cd's through old pc. It did make sound, but was probably one notch better than a walmart boombox. Purchased a separate DAC and noticed immediate improvement. Next got a decent pair of bookshelf speakers and built a class D amp from power supply and development board. Sounded better, but would harshly clip when playing anything remotely dynamic. Midlife crisis rears it head and decided it is time to go all in and build my final system. Kept reading that speakers make most difference so went with those first. Wanted to build everything myself, so researched what speaker kits were out there. Settled on a 4pi kit that that has about 98db sensitivity. Finished these off, sounded great, and could wake the neighbors with just 20 watts of the old NAD. Purchased a highly rated sand amp to replace NAD and was not impressed. The old NAD actually sounded better. That went back for refund and I decided to see if a tube amp would be the ticket to a sweeter sound. Bob's VTA ticked all the right boxes for what I was looking for. Send a couple emails to him and got immediate response answering my questions. Pulled the trigger on a VTA-ST70 with cap upgrades, stepped attenuator and TDR. Took my time and spent 3 days building kit. Poured over the excellent instructions forward, backward and sideways to make sure I had wiring correct. Bob's quick responses to my emails definitely saved my bacon in one instance. On my power supply, the red and red/yellow wires were coming out of the opposite holes that were showing in the picture included with the instructions and even online. I was ready to wire it thinking the factory swapped the wire colors. Emailed Bob and he promptly replied "No, stay with the colors of wires no matter what hole they come out of". Pretty sure connecting power transformer wires to wrong spots would not have had a happy ending. Anyways, after following the test and startup instructions, everything worked! This is a testament to the excellent instructions and support that come with the kit. Before this kit, the last tube I saw was when I was the ankle biter and Dad was fighting with the console TV swapping tubes out and hearing words I'm pretty sure my Mom didn't want me to know. Well, I have been greatly enjoying this amp for the last week listening to music that just sounds right. Only minor tweaks from here out. Again, I can't say enough about the support Bob gives with his kits, and also to rest of the members here. Pouring over this forum has been greatly educational for someone jumping into the hifi waters again. Congrats Paul, good move. If you wait too long your hearing starts to go and then you'll kick yourself for not making the move you did. Post a picture of the amp and the speakers. Welcome to the looney bin, and congrats. Roll a few driver tubes (preferably NOS Sylvanias or equivalent quality) and I bet you'll find an even nicer niche. Hope these work. Thanks for the patience. 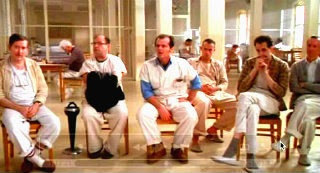 Nurse Ratched: "Alright group, we finished yesterday's session with Mr. McMurphy's comment about sand amps. . ."
Been years since I saw that movie. May be time to queue it up again. down on you if you ask a noob question. Know that first hand.